King Titan Robot rules all the other Robots with an electroplated fist. In fact, his entire body is covered by advanced electroplated armor. 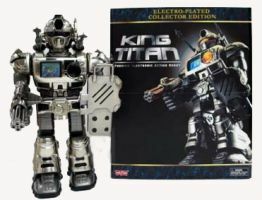 With his weapons ready and his animated data screen giving readouts, King Titan is ready for any action; push the buttons to see him walk, hear him talk, or make other cool robot noises. He runs on only 4 AA batteries (not included). 15 full inches of kingly robotic fury, ready to defend! We're sorry, the King Titan is currently unavailable from the manufacturer.